After one long afternoon of the library, I was ready for a Friday night adventure. I do have to admit, spending that much time in one spot (my second floor cubby) allowed me to make significant headway on my international business final paper. That leaves me with studying for marketing and operations management. Anyways, who doesn’t love an old-fashioned diner? 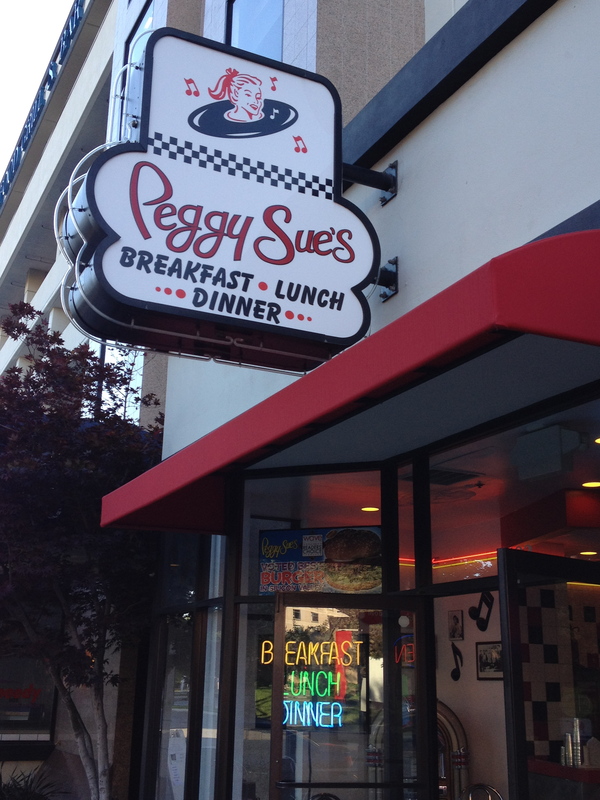 I’m always in search new and fun restaurants and it just so happens I stumbled across Peggy Sue’s diner last week and thought this would be perfect! 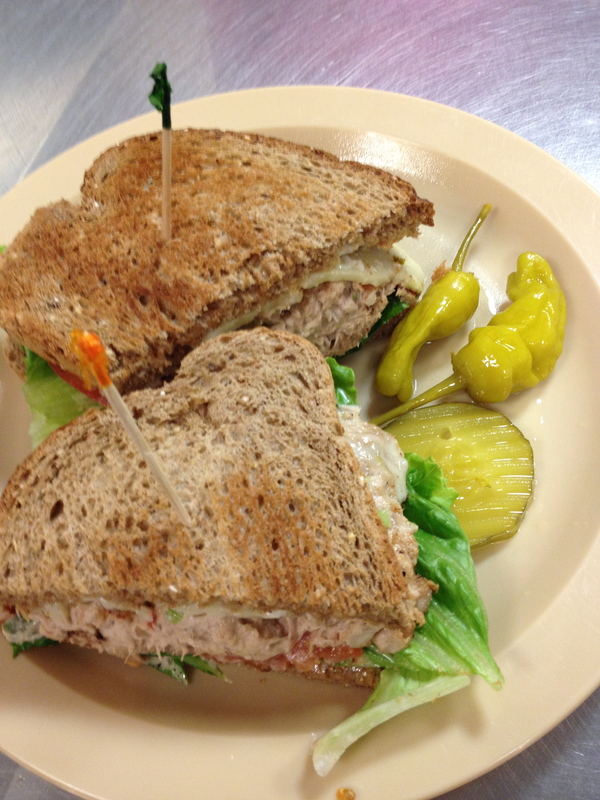 My friend Hallie absolutely loves the 50’s and 60’s; a generation when diners were thriving, and as for the rest of us, we just love the diner atmosphere and the tasty food that usually accompanies it. Living in Pasadena, I am used to all the diners and restaurants having their own sort of lot and lay of the land, a place to spread out, so I was a little surprised to find that it was located in the midst of a few office buildings (actually right next to Adobe Headquarters) and in downtown San Jose. Parking wasn’t great, some scattered spots on the streets or a public parking garage with a set weekend rate of $7, which we settled for. Of course I had research the menu ahead of time, but I still had no clue as to what to order. If only I could choose a few different options and have a little Pu pu platter of each. What I loved about their menu is that each item had the most creative names. 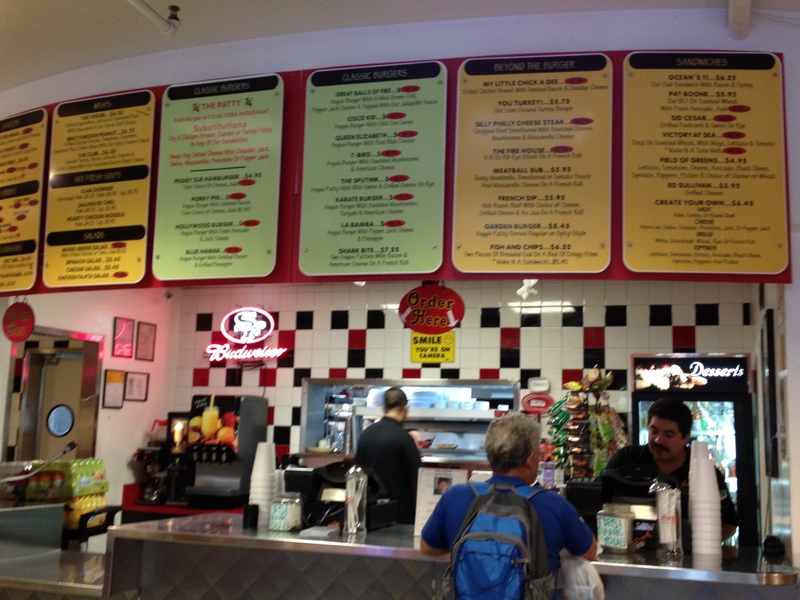 For example, the Blue Hawaii Burger (which I had debated about ordering…probably because it had ‘Hawaii’ in the title), Silly Philly Cheesesteak, My Little Chick a Dee, You Turkey, La Bamba, Karate Burger, Great Balls of Fire, and more. I really could go on, but you should just check it out for yourself. Dreams do really come true 🙂 Somehow drinking legitimate milkshakes in a diner makes everything better. 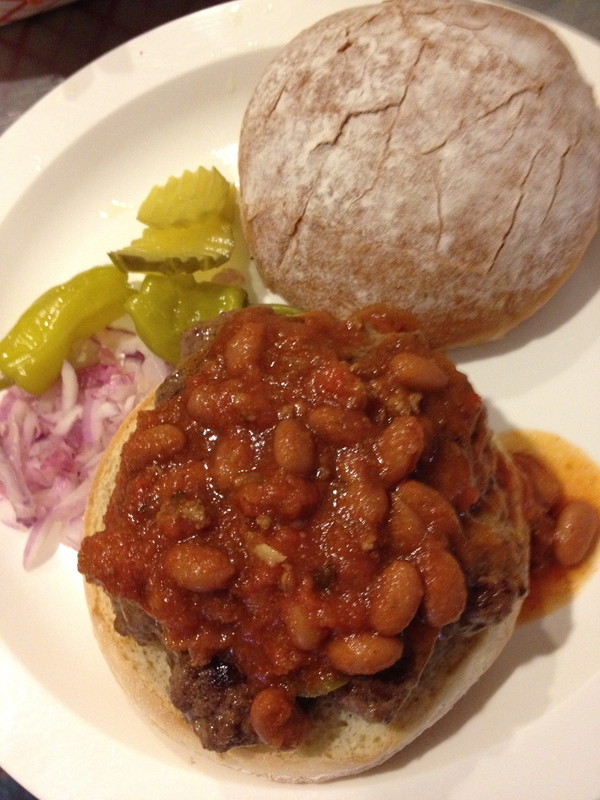 Liz had debated the hot Great Balls of Fire burger, but ended up with the Cisco Kid, a patty with chili. Katie was just “Little Katie” and ordered a cheeseburger with just cheese and a bun, plain, but loved it. Best part was that it was tasty and our meals didn’t break the bank. In fact, I came home with dinner for tomorrow, so it was all in all, a huge success. Afterwards, we made a spontaneous trip to the mall, which I’m sorry if this is sad to say, was quite adventurous and exhilarating. I’m used to a lot of planning and outlining of schedules so it was fun to just make a random trip somewhere. Once we returned, Liz, Katie, and I ended up watching Bridesmaids, which made for one hilarious evening. What other shenanigans can we get into before finals? 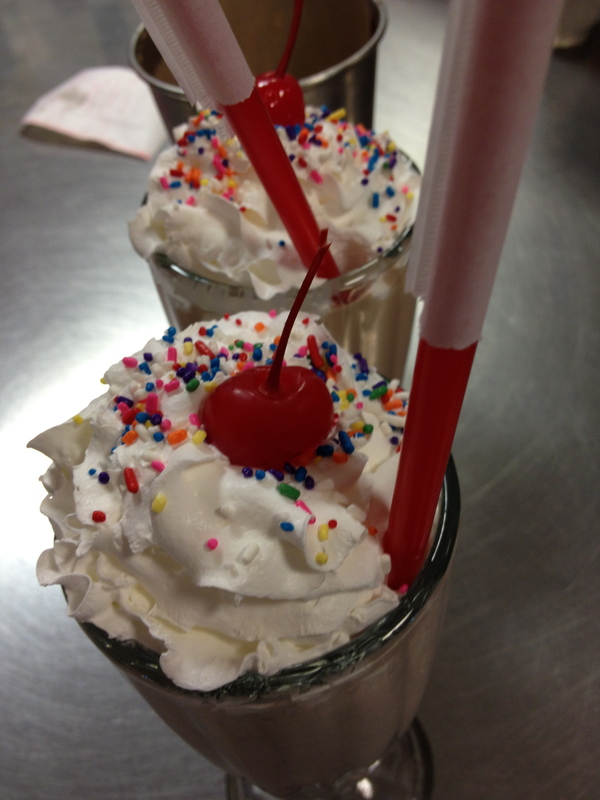 This entry was posted in Eating Out and tagged burger, San Jose by Kaitlin. Bookmark the permalink.